You possible may know of names like Idris Elba, Ama Busia, or Boris Kodjoe, as great Ghanaian talents who are doing so well in Hollywood. However, there are some we dare hazard many Ghanaians don’t know about them and or their exploits in Hollywood – though one might have seen them in some popular Hollywood movies before. Well for those of you who might not know him, he’s the messenger in the movie, “300” who was thrown into the well by the Spartan King after delivering his message. 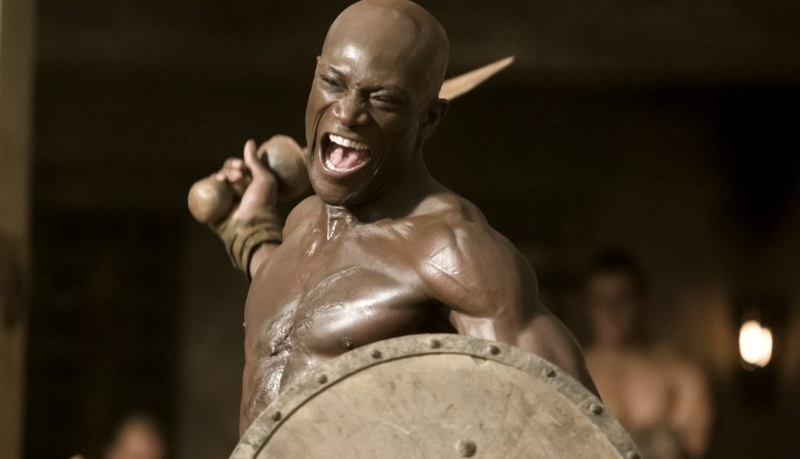 He’s also starred in the series ‘Spartacus’ as the eldest slave in the house of Bartiatis. Aside that, he’s featured in many high budget Hollywood movies such as, Tears of the Sun, Hidalgo, Dead Space and Starz. He’s a Ghanaian born in the UK. Frema is a Ghanaian born in the UK, who played the role of Martha Jones in the BBC science fiction series, Doctor Who and Touch Wood. Born in the Woodberry Down section of London, England, on March 20, 1979, Freema Agyeman is the daughter of an Iranian mother, Azar, and a Ghanaian father, Osei Agyeman. Growing up with an older sister, Leila, and younger brother, Dominic, she was initially interested in science as a child. It wasn’t until her late teens that she developed an interest in acting. Although the product of a Muslim mother and Methodist father, Agyeman grew up attending Roman Catholic schools. She also studied at the Anna Scher Theatre School, and graduated with a degree in performing arts and drama from Middlesex University. When she started acting professionally, Agyeman initially used the spelling “Frema” for her first name to make it easier for casting directors to pronounce. After a series of small guest roles on television, she got a break when she was cast as Lola Wise on the popular soap opera Crossroads. She continued doing TV guest appearances and independent film work, including the role of a crime officer in the movie Rulers and Dealers, written and directed by Stephen Lloyd Jackson. Agyeman is trained in martial arts and did a bit of modeling when she was starting out as an actress. She remains close to her family, who continues to inspire her, and has an upper arm tattoo of the Persian word “raha,” which means “free.” She has also endorsed Divine Chocolate, a company that supports fair trade practices with Ghanaian cocoa farmers. Phanuel Nana Gbewonyo, born in 1980 in Accra is a Ghanaian who left the shores of the country at the age of three, nationalized as an American and ended up starring in the hit movie “Gran Torino” and “Coach Carter”. He’s a good basketball player who played for his school when he was in high school. Gbewonyo played high school basketball at Kennedy High. He began his college career at College of the Canyons (Calif.), where he earned All-Western State Conference honors and was named the team’s Most Valuable Player as a sophomore in the 2000-01 season. He averaged 21 points and eight rebounds that season. So how did a good basketball player end up as an actor? For him, it came as a surprise. After his last HSU basketball game, an agent Gbewonyo had met in California tried to call him. The agent reached Zavier Lewis, a senior education major, and explained that the director of an upcoming movie called ‘Coach Carter’ was looking for a young male to act the part of a teenage basketball player. The agent asked Lewis to help him reach Gbewonyo and see if he wanted the part. Soon Gbewonyo was on a plane back to his home state, where he filmed the movie. Since then, he’s starred in many other movies, “Gran Torino” being one of them. Meet 10-year-old Kwesi Boakye, Hollywood’s latest sensation. Already a veteran actor with an ever-growing resume and roles in several features including Tyler Perry’s “I Can Do Bad All By Myself” staring Academy Award nominee Taraji Henson. He began his career in television commercials at just 10-months-old staring in a video for pre-school kids called “Tots on Tape”. A modeling gig in the worldwide Baby Gap campaign followed and it wasn’t long before Kwesi snagged his first casting role on the medical drama “Strong Medicine”. Since then, he has appeared in a string of prominent television shows such as “Boston Legal”, “South Park”, “Daybreak” with Taye Diggs and the Daytime Soap Opera “Days of Our Lives”. He can also be seen as a series regular on the new Cartoon Network animated series “Gumball” voicing the character role of Darwin. He also voiced Andrew on the animated series “Special Agent Oso” although his most notable voice-over role was in the Oscar winning flick, “Happy Feet”. He is a Ghanaian born in America. Sam is a Ghanaian born in the UK, an actor, producer, rapper and a model. Some of his film works include the Warner Brother comedy with Nick Cannon and Christina Milian “Love Don’t Cost a Thing”, the Gary Marshall comedy “Keeping Up with the Steins” with Jeremy Pivens and Darryl Hannah, and the Spike Lee drama “Sucker Free City” with Anthony Mackie and Omari Hardwick. Sam has also guest starred on such shows as “ER”, “The District”, “Boston Public”, “Navy NCIS”, and “Home Improvement”. In 2001, Sam received an AFI Independent Film Award for Best Supporting actor for his portrayal as Louis in the movie “Street King” co-starring Jon Seda and Mario Lopez. In 2005, Sam was named by Detour Magazine as “Young Hollywood’s One to Watch”. In 2007 Sam co-starred with Tony award winner Wilson Jermaine Heredia in the psychological thriller “Nailed” which was featured and made a buzz in the Cannes Film Festival and the Toronto Film Festival. His latest movie is ANCHOR BABY. In one of the scenes of “Expendables”, rebels held some people hostage and the expendables were to rescue them, the leader asked, “who’s there?” and continued, “Did you bring the money?” well Amoaku is not the leader who spoke, he’s the gentleman on the left hand side of the leader who had a machete on the necks of one of the victims. Aside that, Senyo Amoaku has appeared in three episodes of the TV show Gary Unmarried and as a voice in several video games. Under the name D.N.A., he has composed music for shows like Next, Date My Mom, and Pimp My Ride. He was also in the hit TV series “Heroes”. He’s a Ghanaian born in Ohio, U.S.A. to Mr. Kwame Amoaku and Mrs. Komla Amoaku. Aside acting, he also has composing, screen writing and even production capabilities. With credits ranging from several national commercials to network drama, comedy, as well as big budget action films and moderately financed independent films. Joey Ansah is the cousin of M3nsa of Fokn Boiz duo. He starred in Hollywood movies like “The Borne Ultimatum”, Street Fighter: Assassin’s fist and “Batman Begins”.